Swains Lock is one of my favorite places. It is quiet, yet relatively close to Great Falls. The canal here is usually full of water and the upper lock gate and the waste weir still function. 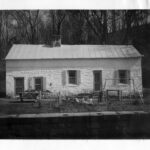 Beside it sits an old lockhouse, which, up until the 1990s, was home to the Swains, one of the last of the canal families. What a beautiful place to grow up or just to visit. I love the way the ground at Swains Lock slopes gently down toward the river. 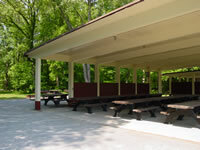 Huge oaks and sycamores shade a small campground and several picnic tables. In the spring, bluebells, trilliums, toothworts, and spring beauties blossom beneath them. However, recently, a new invader has begun to rob Swains Lock of some of her beauty-garlic mustard. Garlic mustard is a very aggressive invasive plant. 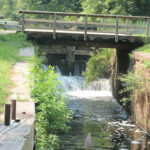 It is rapidly becoming a huge problem in the C&O Canal NHP (and elsewhere in our communities). 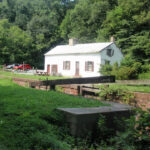 The C&O Canal Association is working to remove it at Swains Lock, Carderock, Edwards Ferry, Antietam Creek and Brunswick. I have worked with the Association on garlic mustard sites in Swains Lock and at Carderock. Last year was the third year at the Carderock site and it looked pretty good. There is hope for places like Swains Lock, but it takes volunteer involvement. The plant appears in early spring and is a fast growing biennial with very different appearances in its first and second years. During its first year the plant nestles close to the ground and its leaves are a rounded, scalloped-edge heart shape. In the second year, it can grow chest-high, its leaves are more arrow-shaped with serrated edges, and it produces small white flowers with four petals. In its second year garlic mustard is capable of spreading hundreds of seeds per plant. It generally appears in early March and goes to seed beginning in April and into June. Once seeds are produced the plant dies, but its long slender erect seed pods can be seen on the dead stalks. To make matters worse, those seeds can stay viable in the soil for five or more years, meaning they can still germinate years later. Disposal of hand-pulled plants by incineration seems to be the best way to ensure the seeds don't germinate. It is not difficult to remove the second year plants but the area must be revisited for several years to be certain seed stores have been exhausted. Garlic mustard is not native to North America. It is thought to have come with 19th-century immigrants from Northern Europe as a food and/or medicinal plant because it is available in early spring when other greens are not. It is unwelcome. 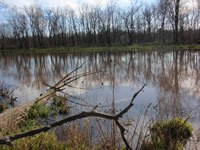 In places like Swains Lock, it is starting to crowd out the native flowering plants. It has no natural enemies, not even whitetail deer, and pollinating insects and caterpillars are not attracted to it. Growths of garlic mustard can also create a shortage of insects that are essential for the diet of birds. A world invaded by garlic mustard could create a silent spring monoculture. The C&O Canal Association challenges you to join us and sign up for the Garlic Mustard Challenge to help rid our park of garlic mustard. The Challenge will tackle the second-year plant, which is easily identified with its height and flowers. We'll provide training for dealing with garlic mustard and its surroundings. We'll need to identify specific areas of the park where it thrives and will work closely with park staff to be sure efforts to remove garlic mustard at a given site would not impact other desirable plants or resources. We encourage adoption of these areas by registered volunteers who are willing to stick with it for several years to come. It is not difficult to remove the second year plants, but sites must be revisited for several years to be sure it will not return the area. 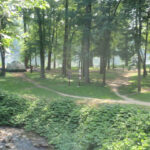 If in your travels along the towpath or at the hiker/biker sites and campgrounds you recognize an area in need of attention, rise to the challenge! 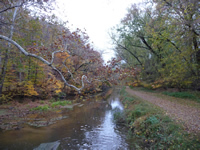 Sign up for the C&O Canal Association's Garlic Mustard Challenge by contacting Jim Heins ([email protected], or 301-949-3518) or Steve Dean ([email protected], or 301-904-9068).